Last week I shared to you How I Still Choose to Love Budgeting Even If it Doesn't Love Me Back. I even gave my resolution and one of the key items is to track where my money goes. I searched in Pinterest some formats of expense tracker. I can easily use Excel to create a spreadsheet but then I thought it would be better to manually record everything I spend. So come my DIY Spending Tracker. I just started using it last Monday and I love it! Create four columns in a sheet of your notebook. I felt like a usual notebook size will be too big for a Do It Yourself Spending Tracker Notebook. I wanted it to be small and handy so I can bring it anywhere, anytime. I specifically choose the notebook brand because the paper is good quality. I also love that the spring is on top because logging my items are way easier. I can flip it faster. I put the month as a title and have my starting amount. To indicate that it is the amount that came to my possession (to spend money) I put an "IN" status. Then I just go with my usual day and record what I bought or where I spent my money. I also try my hardest to record immedietly so that I don't miss any amount. At the end of the day I subtract each money spent to my starting money. The difference will be tagged as "RB" meaning "Remaining Balance" on the status. This will be the starting amount for the following day. Then just repeat the process. If ever I receive any money other than my Remaining Balance, I put an "IN" Status. No matter how small or big I spent, I record them in this Do It Yourself Spending Tracker Notebook. I suddenly became aware of how I use my money. This is slowly changing me from being an impulsive shopper to becoming a wiser woman who can spend her money better. 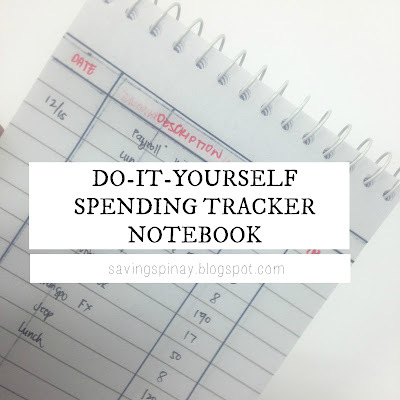 If ever you recreate this DIY Spending Tracker Notebook then please let me know in the comment section below! 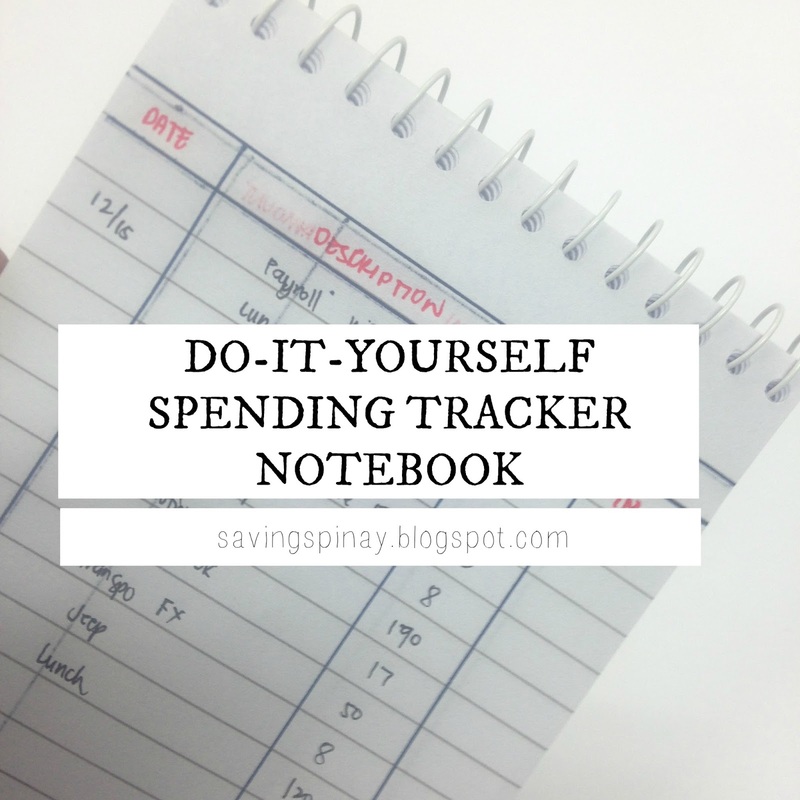 You can also visit the SavingsPinay FB Group and share your own Spending Tracker Notebook!!! 4 comments on "Do It Yourself Spending Tracker Notebook"
Yes sis! Medyo matrabaho nga lang talaga mag lista hehe. Salamat for reading and visiting my blog! Hi. I use Wally. It's a mobile app. Super helpful. I list my expenses, put them in categories, and the app gives me a report on how much I've spent, which category (makeup, food, etc). It has a lot of other useful info (like income, budget, etc) but it's easy enough to understand. Other apps I like are BudgetCare and Toshl. Pero Wally yung pinakagamit ko. I tried to use app before pero di ko talaga masundan hehe. I guess I have to check Wally!!!. Thanks for the recommendation Ms. Mia!